Dungeon tileset by Calciumtrice, usable under Creative Commons Attribution 3.0 license. 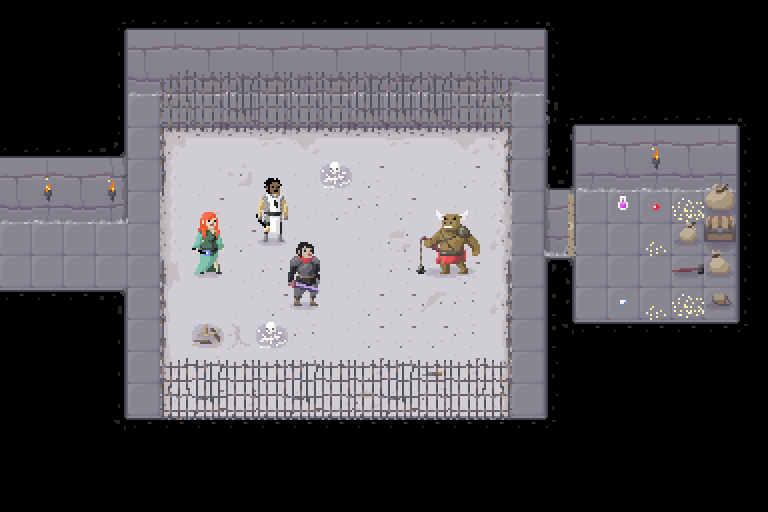 An original dungeon tileset suited for rogue-likes with 16x16 tiles and a wall height of 32 pixels. 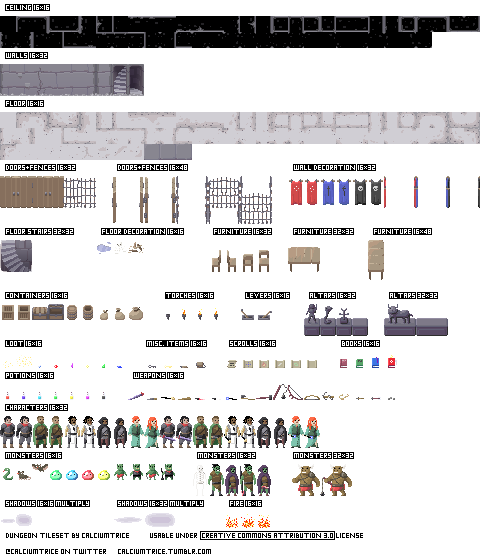 The tileset includes walls, ceilings, floors, doors and gates, furniture and containers, characters, monsters and items. 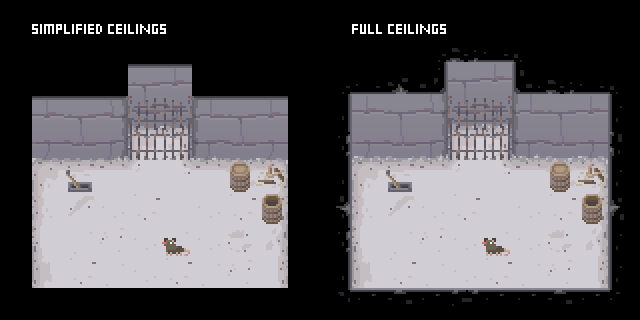 Two varieties of the tileset are included: with or without complex ceilings. In the simple tileset, ceilings are omitted and a finish included at the top of wall tiles. I included the simplified version as I understand the standard version's ceiling edging might be too fiddly to use so you can take your pick! 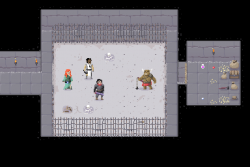 Floors and ceilings should include edges for all possible tile placements. 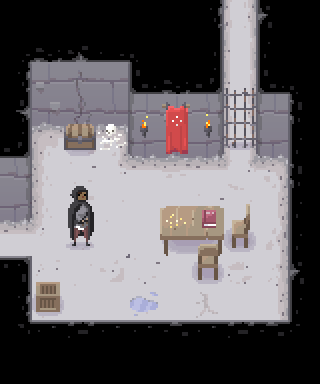 If used, shadows should be applied as a multiply layer between characters/objects and floor tiles. 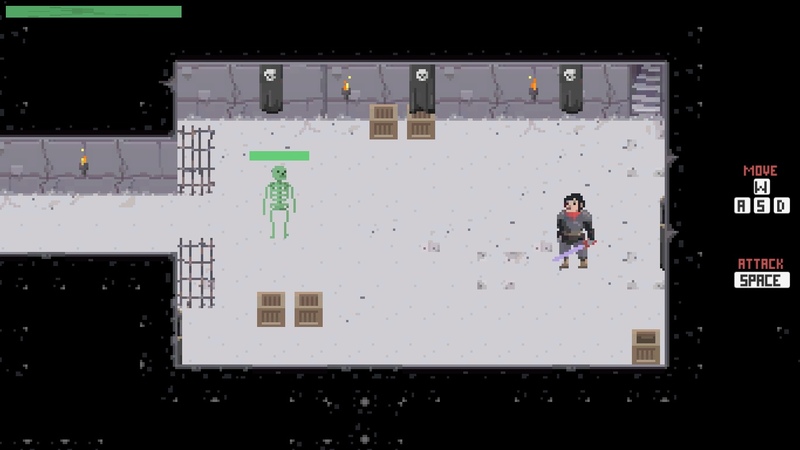 Character and monster sprites include both versions with a weapon and unarmed versions that may be useful for editing. 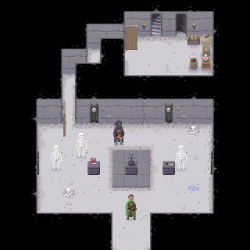 For best results, most items and characters should be offset a little vertically so they appear to be standing in the middle of a tile rather than the edge. This should give a better sense of scale and depth but naturally, feel free to experiment with what feels best for you. Chairs (furniture 16x32), containers, torches, levers, loot, misc. 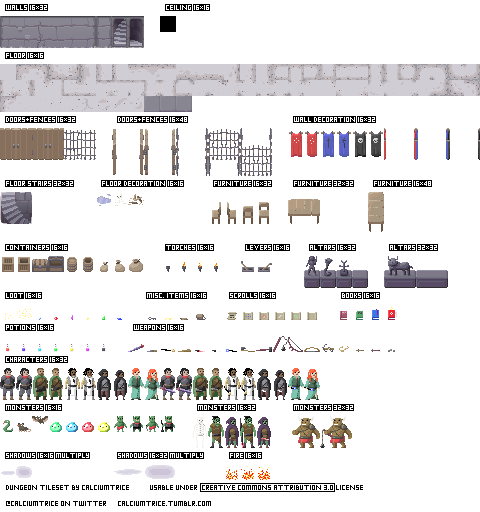 items, scrolls, books, potions, weapons, characters, monsters and fire. Wow. This is really, really good. Mind if I use some of this?